Michigan SEO Group: SEO and Giving Back! We’ve talked about this before, but at Network Services Group (NSG) and Michigan SEO Group (MSG) we try to run our business based on principles. One of the most powerful principles that we’ve found is that consistent effort performed over the long term produces amazing results. Consistency pays dividends. Nick Sunio, NuStepping to end Alzheimer's on The Longest Day. This is especially true for the work we do for our customers, but it’s also true in many other areas, and with life in general. Want to lose weight? We all know what we need to do – eat healthy and exercise. That’s not the hard part. What’s hard is doing it consistently. One thing that we’d like to do more of is giving back. We feel blessed to be able to help our clients doing work that we love, but we also love supporting other worthy causes and doing our little part to make the world a better place. Giving back. In the past we’ve supported many worthy causes. We’ve participated in the ALS ice water challenge. The 22 push-up challenge to support veterans who suffer from PTSD. Habitat for Humanity. We’ve also worked with, and made donations to other non-profit organizations such as the Brain Injury Association of Michigan, Partners in Personal Assistance, and the Humane Society of Livingston County. 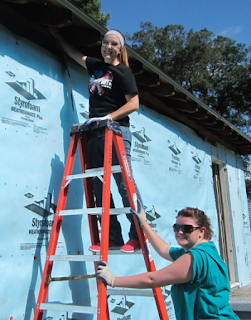 Our Internet Marketing Directors working on Habitat for Humanity. We will continue to participate in, and make donations to support charitable causes that are near and dear to our hearts. While we can’t say yes to everything, we do want to step up and make giving less of something we do on an ad-hoc basis, and more of something we do on a regular basis. To that end, and applying the principle of consistency pays dividends, we are going to be making regular monthly donations to worthwhile causes. We are going to start off by giving $200 per month to causes that we hold near and dear to our hearts. We realize that this isn’t a huge amount of money, but it’s a start. It’s something we feel we can do every month on a consistent basis, and we can always look for additional opportunities to donate when we have the additional time and resources to do so. We’ll be picking causes that our principles hold near and dear. We’ll also ask for input from our team members, so we can support causes that they love. It’s just one more reason for them to feel good about the work they do here. Who knows? Maybe we’ll get some publicity. Maybe some of the people we know will see us doing our bit, and it will encourage them to do theirs. But more importantly, we want to feel good about supporting these causes, and hopefully our humble donations can help make a difference. A wise man once said that making a difference in the world means that other people need to know what you did. That’s why we’re putting this out there. We’re going to do it. We’re going to feel good about it. We hope that you will join us. How to Step Up and Truly Make a Difference! Decoding SEO: Get The Facts From Our Experts! Is Your Website Mobile Friendly? Consider This!